I've got a great post coming at you tonight, but in the mean time, I wanted to share with you that I'm having another GIVEAWAY!! We all know how much I rave about Bruegger's Bagels. It brings me back to my Penn State days where we would all scurry into the place, grab warm bagels and coffee and bear the cold Big Ten weather. How I miss it. THE GREAT NEWS IS THAT BRUEGGER'S ARE ALL OVER THE COUNTRY!!! 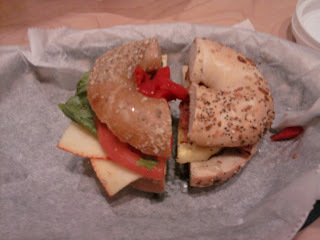 Bruegger's is still offering their 4 under $4.00 menu. They just added the Chipotle Spinach Egg Sandwich to their line up of the "Western" Sandwich, Egg White and Sundried Tomato Sandwich, or the Classic Egg, Cheddar and Bacon sandwich. 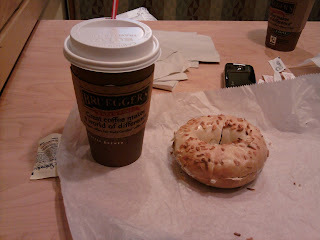 Click here to go the the Bruegger's site and check it out. All good. I've truly tried them all. 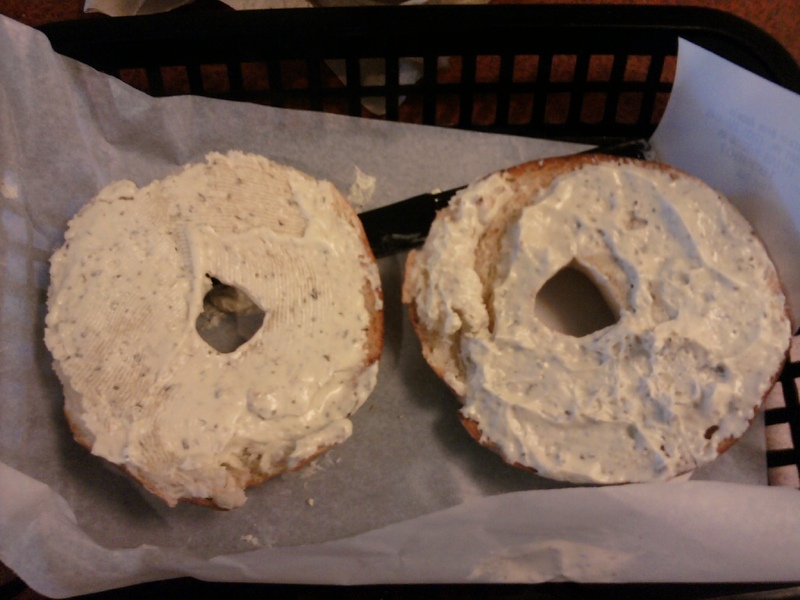 Anyway, you can win $20.00 in Bruegger's cash if you publicly follow this blog on blogger and make a comment on this post telling me what your favorite bagel creation is! Good luck! The winner will be randomly chosen on Sunday! Me, me, me!! I missed the last giveaway--and I die for the rosemary olive oil bagels from Bruegger's with bacon, egg and cheeeeese! I don't think we have a Bruegger's, but I do love bagels, I'd have mine with an egg, some crispy prosciutto, and a dollop of pesto! Have a great day! Omg, this is the greatest prize ever! And in my excitement, I failed to mention that the asiago with bacon scallion cream cheese is out of control! Ahh! Jessie! I can't wait to see you on Friday :) Some of my favorite memories are of when we would travel to other BigTen schools and we would scope out a Bruegger's for the morning. Hmm since I like everything plain and simple, salt bagel with egg and cheese!